Nickname(s): "Old Line State", "Free State", "Little America", "America in Miniature"
Maryland ( /ˈmɛrᵻlənd/) is a state in the Mid-Atlantic region of the United States, bordering Virginia, West Virginia, and Washington, D.C. to its south and west; Pennsylvania to its north; and Delaware to its east. The state's largest city is Baltimore, and its capital is Annapolis. Among its occasional nicknames are Old Line State, the Free State, and the Chesapeake Bay State. The state is named after the English queen Henrietta Maria of France. Maryland is one of the smallest U.S. states in terms of area, as well as one of the most densely populated, with around six million residents. As of 2009, Maryland had the highest median household income of any state, owing in large part to its close proximity to the nation's capital and a highly diversified economy spanning manufacturing, services, and biotechnology. Maryland is bounded on its north by Pennsylvania, on its west by West Virginia, on its east by Delaware and the Atlantic Ocean, and on its south, across the Potomac River, by West Virginia and Virginia. The mid-portion of this border is interrupted by Washington, D.C., which sits on land that was originally part of Montgomery and Prince George's counties and including the town of Georgetown, Maryland. This land was ceded to the United States Federal Government in 1790 to form the District of Columbia. (The Commonwealth of Virginia gave land south of the Potomac, including the town of Alexandria, Virginia, however Virginia retroceded its portion in 1846). The Chesapeake Bay nearly bisects the state and the counties east of the bay are known collectively as the Eastern Shore. The lack of any glacial history accounts for the scarcity of Maryland's natural lakes, yet the oft-repeated claim that Maryland is the only state without natural lakes is not true. Laurel Oxbow Lake is an over one-hundred-year-old 55-acre natural lake two miles north of Maryland City and adjacent to Russett. "Chews Lake" is a seven-acre natural lake two miles south-southeast of Upper Marlboro. There are numerous man-made lakes, the largest of them being the Deep Creek Lake, a reservoir in Garrett County in westernmost Maryland. Many foreign species are cultivated in the state, some as ornamentals, others as novelty species. 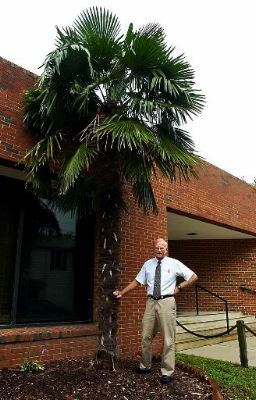 Included among these are the crape myrtle, Italian cypress, southern magnolia, live oak in the warmer parts of the state, and even hardy palm trees in the warmer central and eastern parts of the state. USDA plant hardiness zones in the state range from Zones 5 and 6 in the extreme western part of the state to Zone 7 in the central part, and Zone 8 around the southern part of the coast, the bay area, and parts of metropolitan Baltimore. Invasive plant species, such as kudzu, tree of heaven, multiflora rose, and Japanese stiltgrass, stifle growth of endemic plant life. Maryland's state flower, the black-eyed susan, grows in abundance in wild flower groups throughout the state. The state insect, the Baltimore checkerspot butterfly, is not common as it is near the southern edge of its range. 435 species of birds have been reported from Maryland. The state harbors a great number of white tailed deer, especially in the woody and mountainous west of the state, and overpopulation can become a problem from year to year. Mammals can be found ranging from the mountains in the west to the central areas and include black bears, bobcats, foxes, coyotes, raccoons, and otters. Maryland's reptile and amphibian population includes the diamondback terrapin turtle, which was adopted as the mascot of University of Maryland, College Park. The state is part of the territory of the Baltimore oriole, which is the official state bird and mascot of the MLB team the Baltimore Orioles. Precipitation in the state is characteristic of the East Coast. Annual rainfall ranges from 35 to 45 inches (890 to 1,100 mm) with more in higher elevations. Nearly every part of Maryland receives 3.5–4.5 inches (89–110 mm) per month of rain. Average annual snowfall varies from 9 inches (23 cm) in the coastal areas to over 100 inches (250 cm) in the western mountains of the state. The Catholic George Calvert, 1st Lord Baltimore (1579–1632), sought a charter from King Charles I for the territory between Massachusetts to the north and Virginia to the immediate south. After George Calvert died in April 1632, the charter was granted to his son, Cecilius Calvert, 2nd Baron Baltimore (1605–1675), on June 20, 1632. Officially, the new "Maryland Colony" was named in honor of Henrietta Maria of France, wife of Charles I of England. Alternatively, Some Catholic scholars and historians believe Maryland may have been named after Mary, the mother of Jesus, by George Calvert, 1st Lord Baltimore prior to his death in 1632. His original intent may never fully be known. The specific name given in the charter was phrased Terra Mariae, anglice, Maryland. The English name was preferred due to undesired associations of Mariae with the Spanish Jesuit Juan de Mariana, linked to the Inquisition. In addition, Henrietta was never referred to by both her first and middle name. Scholars also agree that under no circumstances was a territory ever named after someone's middle name. 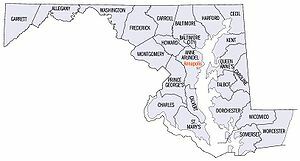 Many agree that since the original capital of Maryland was St. Mary's City on the north shore of the Potomac River – and the county surrounding it, the first erected/created in the province, was named St. Mary's County – Maryland was most likely named after Mary, the mother of Jesus Christ. The great seal of Maryland also supports this conclusion. The obverse side of the seal reads TERRÆ MARIÆ, which translates in Latin as "Land of Mary" instead of TERRÆ MARIA, which would acknowledge Henrietta's middle name. Maryland was founded for the purpose of providing religious toleration of England's Roman Catholic minority. In 1642 a number of Puritans left Virginia for Maryland and founded Providence (now called Annapolis) on the western shore of the upper Chesapeake Bay. A dispute with traders from Virginia over Kent Island in the Chesapeake led to armed conflict. In 1644 William Claiborne, a Puritan, seized Kent Island while his associate, the pro-Parliament Puritan Richard Ingle, took over St. Mary's. Both used religion as a tool to gain popular support. The two years from 1644–1646 that Claiborne and his Puritan associates held sway were known as "The Plundering Time". They captured Jesuit priests, imprisoned them, then sent them back to England. After England's "Glorious Revolution" of 1688, Maryland outlawed Catholicism. This lasted until after the American Revolutionary War (1775–1783). Wealthy Catholic planters built chapels on their land to practice their religion in relative secrecy. Maryland was one of the thirteen colonies that revolted against British rule in the American Revolution. On February 2, 1781, Maryland became the 13th state to approve the ratification of the Articles of Confederation which brought into being the United States as a united, sovereign and national state. It also became the seventh state admitted to the U.S. after ratifying the new Constitution. In December 1790 Maryland donated land selected by President George Washington to the federal government for the creation of the new national capital of Washington, D.C. The land was provided from Montgomery and Prince George's counties, as well as from Fairfax County and Alexandria in Virginia; however, the land donated by Virginia was later returned to that state by the District of Columbia retrocession. The state remained with the Union during the Civil War, due in significant part to demographics and Federal intervention. By 1860, 49% of Maryland's African Americans were free blacks. A new state constitution in 1864 abolished slavery, and following passage of constitutional amendments that granted voting rights to freedmen, in 1867 the state extended suffrage to non-white males. Compared to some other states, blacks were better established both before and after the civil war. Nearly half the population was free before the war, and some had accumulated property. Half the population lived in cities. Literacy was high among blacks and, as Democrats crafted means to exclude them, suffrage campaigns helped reach blacks and teach them how to resist. Whites did impose racial segregation in public facilities and Jim Crow laws, which effectively lasted until passage of federal civil rights legislation in the mid-1960s. The Great Baltimore Fire of 1904 burned over 30 hours, destroying 1,526 buildings and spanning 70 city blocks. More than 1,231 firefighters worked to bring the blaze under control. With the nation's entry into World War I in 1917, new military bases such as Camp Meade, the Aberdeen Proving Ground, and the Edgewood Arsenal were established. Existing facilities, including Fort McHenry, were greatly expanded. African Americans form a sizable portion of the state's population – nearly 30 percent in 2010. Most are descendants of people transported to the area as slaves from West Africa, and many are of mixed race, including European and Native American ancestry. New residents of African descent include 20th-century and later immigrants from Nigeria, particularly of the Igbo and Yoruba tribes. Concentrations of African Americans live in Baltimore City, Prince George's County, a suburb of Washington, D.C., where many work; Charles County, western parts of Baltimore County, and the southern Eastern Shore. Irish American populations can be found throughout the Baltimore area, and the Northern and Eastern suburbs of Washington D.C. in Maryland (descendents of those who moved out to the suburbs of Washington's once predominantly Irish neighborhoods), as well as Western Maryland, where Irish immigrant laborers helped to build the C & O Railroad. Smaller but much older Irish populations can be found in Southern Maryland, with some roots dating as far back as the early Maryland colony. This population, however, still remains culturally very active and yearly festivals are held. Maryland has been prominent in U.S. Catholic tradition, partially because it was intended by George Calvert as a haven for English Catholics. Baltimore was the seat of the first Catholic bishop in the U.S. (1789), and Emmitsburg was the home and burial place of the first American-born citizen to be canonized, St. Elizabeth Ann Seton. Georgetown University, the first Catholic University, was founded in 1789 in what was then part of Maryland. The Basilica of the National Shrine of the Assumption of the Virgin Mary in Baltimore was the first Roman Catholic cathedral built in the United States, and the Archbishop of Baltimore is, albeit without formal primacy, the United States' quasi-primate, and often a cardinal. Among the immigrants of the 19th and 20th century from eastern and southern Europe were many Catholics. The Bureau of Economic Analysis estimates that Maryland's gross state product in 2012 was $317.7 billion. However, Maryland has been using Genuine Progress Indicator, an indicator of well-being, to guide the state's development, rather than relying only on growth indicators like GDP. According to the U.S. Census Bureau, Maryland households are currently the wealthiest in the country, with a 2013 median household income of $72,483 which puts it ahead of New Jersey and Connecticut, which are second and third respectively. Two of Maryland's counties, Howard and Montgomery, are the second and eleventh wealthiest counties in the nation respectively. Maryland ranked No. 1 with the most millionaires per capita in 2013, with a ratio of 7.7 percent. Also, the state's poverty rate of 7.8 percent is the lowest in the country. per capita personal income in 2006 was $43,500, fifth in the nation. As of May 2014, the state's unemployment rate was 5.5 percent. Maryland is home to defense contractor Emergent BioSolutions, which manufactures and provides an anthrax vaccine to U.S. government military personnel. As of April 2014, Emergent had sold over 66 million doses of BioThrax to the U.S. government. Forbes recognized Emergent as the top performing company in the state of Maryland for the 2015–2016 fiscal year. Tourism is popular in Maryland, with tourists visiting the city attractions of Baltimore, the beach attractions of the Eastern Shore, and the nature attractions of western Maryland, as well as many passing through en route to Washington, D.C. Baltimore attractions include the Harborplace and the Baltimore Aquarium, as well as the popular Camden Yards baseball stadium. Ocean City on the Atlantic Coast has been a popular beach destination in summer, particularly since the Chesapeake Bay Bridge was built in 1952 connecting the Eastern Shore to the more populated Maryland cities. The Maryland Department of Transportation, headquartered in the Hanover area of unincorporated Anne Arundel County, oversees most transportation in the state through its various administration-level agencies. The independent Maryland Transportation Authority, headquartered in Baltimore, maintains and operates the state's eight toll facilities. I-83 has 34 miles (55 km) in Maryland and connects Baltimore to southern central Pennsylvania (Harrisburg and York, Pennsylvania). Maryland also has an 11-mile (18 km) portion of I-81 that travels through the state near Hagerstown. I-97, fully contained within Anne Arundel County and the second shortest (17.6 miles (28.3 km)) one- or two-digit Interstate highway which connects the Baltimore area to the Annapolis area. Hawaii has one that is shorter. Both I-270 and the Capital Beltway were extremely congested; however, the Intercounty Connector (ICC; MD 200) alleviated some of the congestion over time. Construction of the ICC was a major part of the campaign platform of former Governor Robert Ehrlich, who was in office from 2003 until 2007, and of Governor Martin O'Malley, who succeeded him. I-595, which is an unsigned highway concurrent with US 50/US 301, is the longest unsigned interstate in the country and connects Prince George's County and Washington D.C. with Annapolis and the Eastern Shore via the Chesapeake Bay Bridge. Maryland's state sales tax is 6 percent. All real property in Maryland is subject to the property tax. Generally, properties that are owned and used by religious, charitable, or educational organizations or property owned by the federal, state or local governments are exempt. Property tax rates vary widely. No restrictions or limitations on property taxes are imposed by the state, meaning cities and counties can set tax rates at the level they deem necessary to fund governmental services. If a proposed tax rate increases the total property tax revenues, the governing body must advertise that fact and hold a public hearing on the new tax rate, which is called the Constant Yield Tax Rate process. State elections are dominated by Baltimore and the populous suburban counties bordering Washington, D.C.: Montgomery and Prince George's. Forty-three percent of the state's population resides in these three jurisdictions, each of which contain large, traditionally Democratic voting bloc(s): African Americans in Baltimore and Prince George's, federal employees in Prince George's and Montgomery, and postgraduates in Montgomery. The remainder of the state, particularly Western Maryland and the Eastern Shore, is more supportive of Republicans. Maryland´s best known political figure is a Republican – former Governor Spiro Agnew, who served as United States Vice President under Richard Nixon as Vice President from 1969 to 1973, when he resigned in the aftermath of revelations that he had taken bribes while he was Governor of Maryland. In late 1973 a court found Agnew guilty of violating tax laws. In 1980, Maryland was one of six states to vote for Jimmy Carter. In recentTemplate:Weasel inline years, Maryland has been among the most reliable states for Democratic nominees. In 1992, Bill Clinton fared better in Maryland than any other state except his home state of Arkansas. In 1996, Maryland was Clinton's sixth best, in 2000 Maryland ranked fourth for Gore and in 2004 John Kerry showed his fifth-best performance in Maryland. In 2008 Barack Obama won the state's 10 electoral votes with 61.9 percent of the vote to John McCain's 36.5 percent. As of September 2016, Maryland supported the Democratic nominee in each of the last six presidential elections, by an average margin of 15.4 percent. Both of Maryland's U.S. Senators and seven of its eight Representatives in Congress are Democrats, and Democrats hold a supermajority in the state Senate. While Republicans usually win more counties, by piling up large margins in the west and east, they are also usually swamped by the more densely populated and heavily Democratic Baltimore-Washington axis. In 2008, for instance, McCain won 17 counties to Obama's six; Obama also carried Baltimore City. While McCain won most of the western and eastern counties by margins of 2-to-1 or more, he was almost completely shut out in the larger counties surrounding Baltimore and Washington; every large county except Anne Arundel went for Obama. From 2007 to 2011 U.S. Congressman Steny Hoyer (MD-5), a Democrat, was elected as Majority Leader for the 110th Congress of the House of Representatives, and 111th Congress, serving in that post. His district covers parts of Anne Arundel and Prince George's counties, in addition to all of Charles, Calvert and St. Mary's counties in southern Maryland. In 2010 Republicans won control of most counties. The Democratic Party remained in control of eight county governments including Baltimore City. In 2014 Larry Hogan, a Republican, was elected Governor of Maryland. Hogan is the second Republican to become the Governor of Maryland since Spiro Agnew's resigned in 1969 to become Vice President. Maryland has many popular sources of media. A well known newspaper is The Baltimore Sun. Memorial Chapel at the University of Maryland, College Park, Maryland's largest university. In 2008 the state led the entire country in the percentage of students passing Advanced Placement examinations. 23.4 percent of students earned passing grades on the AP tests given in May 2008. This marks the first year that Maryland earned this honor. Three Maryland high schools (in Montgomery County) were ranked among the top 100 in the country by US News in 2009, based in large part on AP test scores. The first public university in the state is the University of Maryland, Baltimore, which was founded in 1807 and contains the University of Maryland's only public academic health, human services, and one of two law centers (the other being the University of Baltimore School of Law). Seven professional and graduate schools train the majority of the state's physicians, nurses, dentists, lawyers, social workers, and pharmacists. The largest undergraduate institution in Maryland is the University of Maryland, College Park which was founded as the Maryland Agricultural College in 1856 and became a public land grant college in 1864. Towson University, founded in 1866, is the state's second largest university. Baltimore is home to the University of Maryland, Baltimore County and the Maryland Institute College of Art. The majority of public universities in the state are affiliated with the University System of Maryland. Two state-funded institutions, Morgan State University and St. Mary's College of Maryland, as well as two federally funded institutions, the Uniformed Services University of the Health Sciences and the United States Naval Academy, are not affiliated with the University System of Maryland. The Baltimore Orioles are the state's Major League Baseball franchise. The National Hockey League's Washington Capitals and the National Basketball Association's Washington Wizards formerly played in Maryland, until the construction of an arena in Downtown D.C. in 1997 (originally known as MCI Center, renamed Verizon Center in 2006). ^ "Maryland's quality of life ranks high compared to other states". FindArticles.com (The Daily Record (Baltimore)). December 11, 2004. http://findarticles.com/p/articles/mi_qn4183/is_20041211/ai_n10064724/. Retrieved June 4, 2009. ^ "Maryland Facts". Maryland Office of Tourism. http://www.visitmaryland.org/Students/Pages/MarylandFacts.aspx. Retrieved June 2, 2009. ^ "Great Seal of Maryland (reverse)". Maryland State Archives. http://msa.maryland.gov/msa/mdmanual/01glance/html/symbols/reverse.html. Retrieved March 4, 2014. ^ "Population and Housing Unit Estimates". U.S. Census Bureau. June 22, 2017. https://www.census.gov/programs-surveys/popest.html. Retrieved June 22, 2017. ^ "Median Annual Household Income". The Henry J. Kaiser Family Foundation. http://kff.org/other/state-indicator/median-annual-income/?currentTimeframe=0. Retrieved December 9, 2016. ^ a b "Elevations and Distances in the United States". United States Geological Survey. 2001. Archived from the original on October 15, 2011. https://web.archive.org/web/20111015012701/http://egsc.usgs.gov/isb/pubs/booklets/elvadist/elvadist.html. Retrieved October 21, 2011. ^ "Maryland's Name". Catholic History of Maryland. Simon & Schuster. http://www.mdarchives.state.md.us/msa/mdmanual/01glance/html/name.html. Retrieved July 20, 2012. ^ a b c "Reconstructing the Brick Chapel of 1667" Page 1, See section entitled "The Birthplace of Religious Freedom" "Archived copy". Archived from the original on March 13, 2014. https://web.archive.org/web/20140313133644/http://www.stmaryscity.org/wp-content/uploads/2013/07/Chapel-Reconstruction.pdf. Retrieved May 3, 2014. ^ Cecilius Calvert, "Instructions to the Colonists by Lord Baltimore, (1633)" in Clayton Coleman Hall, ed., Narratives of Early Maryland, 1633–1684 (NY: Charles Scribner's Sons, 1910), 11–23. ^ "State Median Household Income Patterns: 1990–2010". U.S. Census Bureau. http://proximityone.com/stmhi0910.htm. Retrieved August 6, 2012. ^ "Belgium". CIA World Factbook. Central Intelligence Agency. May 15, 2008. Archived from the original on July 10, 2016. https://web.archive.org/web/20160710084134/https://www.cia.gov/library/publications/the-world-factbook/geos/be.html. Retrieved May 15, 2008. "Area – comparative: about the size of Maryland"
^ Delgado, Patricia (December 2011). "Chesapeake Bay National Estuarine Research Reserve in Maryland Site Profile". Maryland Department of Natural Resources. p. 54. http://dnr.maryland.gov/waters/cbnerr/Documents/publications/CBNERRMD_SiteProfile_Dec2011.pdf. 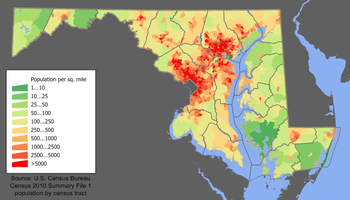 "Map showing ... Maryland physiographic provinces"
^ "M2.0 – Maryland". Archived from the original on January 17, 2013. https://web.archive.org/web/20130117073422/https://earthquake.usgs.gov/earthquakes/dyfi/events/ld/01015030/us/index.html. Retrieved November 25, 2012. ^ "M3.4 – Maryland Potomac-Shenandoah Region". Archived from the original on November 2, 2012. https://web.archive.org/web/20121102234322/https://earthquake.usgs.gov/earthquakes/dyfi/events/us/2010yua6/us/index.html. Retrieved November 25, 2012. ^ "Maryland's Lakes and Reservoirs: FAQ". Maryland Geological Survey. January 24, 2007. http://www.mgs.md.gov/esic/fs/fs15.html. Retrieved February 3, 2008. ^ "Oxbow Nature Preserve; "Laurel Oxbow Lake is the largest naturally occurring body of freshwater in Maryland; other lakes (of significant size) are the result of damming creeks" by man.". The Nature Conservancy. 2016. http://www.nature.org/ourinitiatives/regions/northamerica/unitedstates/maryland_dc/placesweprotect/preserve-visitors-guide-oxbow-nature-preserve.pdf. Retrieved October 1, 2016. ^ "Oxbow Natural Area". Anne Arundel County Recreation and Parks Department. 2016. http://www.aacounty.org/locations-and-directions/oxbow-natural-area. Retrieved October 1, 2016. ^ "Oxbow Observation Platform, may be the largest naturally occurring fresh water lake in Maryland". Russett Community Association. 2009. http://www.russett.org/page/10954~190439/Oxbow-Observation-Platform-Project. Retrieved October 1, 2016. ^ "The National Map (search on Chews Lake)". USGS. 2016. http://nationalmap.gov. Retrieved October 1, 2016. ^ a b Pamela Wood (March 27, 2017). "Maryland General Assembly approves fracking ban". The Baltimore Sun. http://www.baltimoresun.com/news/maryland/politics/bs-md-fracking-ban-passes-20170327-story.html. ^ "MARYLAND AT A GLANCE: STATE SYMBOLS, Maryland State Flower – Black-Eyed Susan". Maryland Manual Online. Maryland State Archives. http://msa.maryland.gov/msa/mdmanual/01glance/html/symbols/flower.html. Retrieved May 20, 2014. ^ Olson, D. M, E. Dinerstein (2001). "Terrestrial Ecoregions of the World: A New Map of Life on Earth". BioScience 51 (11): 933–938. DOI:[0933:TEOTWA2.0.CO;2 10.1641/0006-3568(2001)051[0933:TEOTWA]2.0.CO;2]. ^ "Zone Hardiness Map through Prairie Frontier". Prairiefrontier.com. http://www.prairiefrontier.com/pages/hardiness/zone.html. Retrieved October 24, 2010. ^ The History of Maryland, From its first settlement, in 1633, to the restoration, in 1660, with a copious introduction, and notes and illustrations. Books.google.com. 1837. https://books.google.com/?id=tkwOAAAAIAAJ&pg=PA24. ^ a b c d "Hardiness Zones". Arbor Day Foundation. http://www.arborday.org/media/zones.cfm. Retrieved March 5, 2013. ^ "Invasive Species of concern in Maryland". Mdinvasivesp.org. http://www.mdinvasivesp.org/list_terrestrial_plants.html. Retrieved October 24, 2010. ^ "Official list of the birds of Maryland". Maryland/District of Columbia Records Committee. http://www.mdbirds.org/mddcrc/pdf/mdlist.pdf. Retrieved May 4, 2009. ^ a b "Maryland Animals". Archived from the original on August 30, 2007. https://web.archive.org/web/20070830021023/http://www.sailor.lib.md.us/MD_topics/res/env_ani.html. Retrieved August 30, 2007. ^ Therres, Glenn (Fall 2007). "Lions in our mountains? The mystery of cougars in Maryland" (PDF). Wildlife and Heritage. Maryland Department of Natural Resources. Archived from the original on April 19, 2011. https://web.archive.org/web/20110419203123/http://www.dnr.state.md.us/naturalresource/fall2007/lions.pdf. Retrieved July 6, 2009. "Historically bobcats were distributed statewide but during the post colonization period densities began to plummet. By the mid-1900s, populations had probably reached all-time lows, with remnant populations existing only in western Maryland. This prompted the Department of Natural Resources (DNR) to classify them as a state-listed "Species of Special Concern." During the past quarter century, occupied range and densities have increased markedly. Results from the annual Bowhunter Survey and the Hunter Mail survey have identified bobcat sightings in 14 of Maryland's 23 counties. Currently, bobcats have dual legal classification in Maryland. In addition to the Species of Special Concern designation, they are also defined as a Game Animal / Furbearer with a closed harvest season." ^ "Coyotes in Maryland". Maryland Department of Natural Resources. Archived from the original on August 15, 2011. https://web.archive.org/web/20110815030808/http://www.dnr.state.md.us/wildlife/Hunt_Trap/furbearers/coyote.asp. Retrieved September 16, 2011. "Coyotes were historically a western species with core populations found west of the Mississippi River. Alterations and/or elimination of competing predators during the post-European colonization period facilitated rapid range expansion into eastern North America during the 20th Century. Established populations now occur in every state and province in North America. Coyotes are a relatively new addition to local ecosystems, and were first documented in Maryland during 1972. Initial substantiated sightings occurred in Cecil, Frederick and Washington counties. Since that time population densities and occupied range have expanded incrementally and coyotes now occur statewide." ^ a b c "Assateague Island National Seashore wild Ponies". Assateagueisland.com. http://www.assateagueisland.com/wildlife/pony.htm. ^ a b "Chesapeake Bay Retriever History". K9web.com. http://www.k9web.com/dog-faqs/breeds/chessies.html. Retrieved October 24, 2010. ^ "Maryland Government Website – Maryland State Bird". Msa.md.gov. June 7, 2010. http://www.msa.md.gov/msa/mdmanual/01glance/html/symbols/bird.html. Retrieved October 24, 2010. ^ Goodman, Peter S. (August 1, 1999). "An Unsavory Byproduct: Runoff and Pollution". Washington Post: p. A1. https://www.washingtonpost.com/wp-srv/local/daily/aug99/chicken1.htm. ^ Horton, Tom (January 1, 1999). "Hog farms' waste poses a threat". Baltimore Sun. http://articles.baltimoresun.com/1999-01-01/news/9904280856_1_hog-farm-cafos-factory-hog. ^ Wingfield, Brian; Marcus, Miriam (October 16, 2007). "– America's Greenest States". Forbes.com. https://www.forbes.com/2007/10/16/environment-energy-vermont-biz-beltway-cx_bw_mm_1017greenstates_2.html. Retrieved October 24, 2010. ^ "Snowfall Map". http://www.erh.noaa.gov/er/lwx/Historic_Events/md-snow-avg.gif. Retrieved October 24, 2010. ^ "NowData – NOAA Online Weather Data". National Oceanic and Atmospheric Administration. http://www.nws.noaa.gov/climate/xmacis.php?wfo=lwx. Retrieved December 17, 2012. ^ "Monthly Averages for Oakland, MD". weather.com. http://www.weather.com/weather/wxclimatology/monthly/USMD0294. Retrieved September 28, 2013. ^ "Station Name: MD CUMBERLAND 2". National Oceanic and Atmospheric Administration. ftp://ftp.ncdc.noaa.gov/pub/data/normals/1981-2010/products/station/USC00182282.normals.txt. Retrieved March 5, 2013. ^ "Monthly Averages for Hagerstown, MD". weather.com. http://www.weather.com/weather/wxclimatology/monthly/USMD0195. Retrieved September 28, 2013. ^ "Station Name: MD FREDERICK POLICE BRKS". National Oceanic and Atmospheric Administration. ftp://ftp.ncdc.noaa.gov/pub/data/normals/1981-2010/products/station/USC00183348.normals.txt. Retrieved March 5, 2013. ^ "Station Name: MD MD SCI CTR BALTIMORE". National Oceanic and Atmospheric Administration. ftp://ftp.ncdc.noaa.gov/pub/data/normals/1981-2010/products/station/USW00093784.normals.txt. Retrieved February 27, 2013. ^ "Monthly Averages for Elkton, MD (21921)". The Weather Channel. http://www.weather.com/weather/wxclimatology/monthly/21921. ^ "Station Name: MD OCEAN CITY MUNI AP". National Oceanic and Atmospheric Administration. ftp://ftp.ncdc.noaa.gov/pub/data/normals/1981-2010/products/station/USW00093786.normals.txt. Retrieved March 5, 2013. ^ "Monthly Averages for Waldorf, MD". The Weather Channel. http://www.weather.com/weather/wxclimatology/monthly/graph/USMD0414. ^ "Monthly Averages for Point Lookout State Park [Scotland, MD"]. The Weather Channel. https://weather.com/weather/monthly/l/20687. ^ "Maryland's Name". Maryland at a Glance. Maryland State Archives. http://www.mdarchives.state.md.us/msa/mdmanual/01glance/html/name.html. Retrieved January 21, 2008. ^ Masser, Kristin P.. "Maryland In Focus -- St. Mary's County". http://msa.maryland.gov/msa/speccol/photos/lowe/html/sm_2.html. ^ "Great Seal of Maryland (obverse)". http://msa.maryland.gov/msa/mdmanual/01glance/html/symbols/obverse.html. ^ "Indentured Servants and the Pursuits of Happiness Script error". Crandall Shifflett, Virginia Tech. ^ Dilts, James D. (1993). The Great Road: The Building of the Baltimore and Ohio, the Nation's First Railroad, 1828–1853. Palo Alto, CA: Stanford University Press. p. 80. ISBN 0-8047-2235-8. ^ Stover, John F. (1987). History of the Baltimore and Ohio Railroad. West Lafayette, IN: Purdue University Press. p. 18. ISBN 0-911198-81-4. ^ Walter Coffey (April 29, 2016). "Maryland Remains in the Union". Walter Coffey. https://civilwarmonths.com/2016/04/29/maryland-remains-in-the-union/. ^ Vogler, Mark E. (April 18, 2009). "Civil War Guard on duty in Baltimore to save President Street Station". eagletribune.com. Eagle Tribune. Archived from the original on April 19, 2009. https://archive.is/20090419134532/http://www.eagletribune.com/punews/local_story_107204538.html. Retrieved April 28, 2015. ^ "Bird's Eye View of Cumberland, Maryland 1906". 1906. http://www.wdl.org/en/item/11374/. ^ Cairns, Huntington (December 1937). "History and Constitutionality of the Maryland Income Tax Law". Legal History, Theory and Process Commons. UM Carey Law. pp. 1, 6. http://digitalcommons.law.umaryland.edu/cgi/viewcontent.cgi?article=1093&context=mlr. ""...1937 Special Session of the Maryland Legislature imposed an income tax...expenditure of public funds for the benefit of able-bodied persons whose inability to support themselves arises from the prevalence of wide-spread unemployment."" ^ a b "William Preston Lane Jr. Memorial Bay Bridge – History". baybridge.com. http://www.baybridge.com/cms/index.php?option=com_content&task=view&id=16&Itemid=. Retrieved February 5, 2008. ^ a b "Table 1. Annual Estimates of the Resident Population for the United States, Regions, States, and Puerto Rico: April 1, 2010 to July 1, 2015" (CSV). U.S. Census Bureau. December 24, 2015. Archived from the original on December 23, 2015. https://web.archive.org/web/20151223235718/http://www.census.gov/popest/data/state/totals/2015/tables/NST-EST2015-01.csv. Retrieved December 24, 2015. ^ "Population and Population Centers by State – 2000". United States Census Bureau. http://www.census.gov/geo/www/cenpop/statecenters.txt. Retrieved December 5, 2008. ^ "The South As It's [sic] Own Nation". League of the South. 2004. http://dixienet.org/New%20Site/thesouthasitsownnation.shtml. Retrieved May 23, 2008. "On the other hand, areas beyond these thirteen States maintain their Southern culture to varying degrees. Much of Missouri remains basically Southern, as do parts of southern Maryland and Maryland's eastern shore." ^ Beck, John; Randall, Aaron; Frandsen, Wendy (June 27, 2007). "Southern Culture: An Introduction" (PDF). Durham, North Carolina: Carolina Academic Press. pp. 14–15. http://www.cap-press.com/pdf/1517.pdf. Retrieved May 23, 2008. "Kentucky, Missouri, West Virginia [...] and Maryland —slaveholding states and regions before the Civil War that did not secede from the Union – are also often included as part of the South. As border states, these states always were crossroads of values and customs, and today [...] parts of Maryland seem to have become part of the "Northeast."" ^ "Regions of the United States". American Memory. The Library of Congress. http://memory.loc.gov/ammem/gmdhtml/rrhtml/regdef.html. Retrieved August 11, 2009. ^ "Region 3: The Mid-Atlantic States". www.epa.gov. U.S. Environmental Protection Agency. http://www.epa.gov/region03/index.htm. Retrieved August 11, 2009. ^ "Your Local FBI Office". www.fbi.gov. Federal Bureau of Investigation. Archived from the original on August 15, 2009. https://web.archive.org/web/20090815093807/http://www.fbi.gov/contact/fo/fo.htm. Retrieved August 11, 2009. ^ "Routes Serving the Northeast". National Railroad Passenger Corporation. http://www.amtrak.com/servlet/ContentServer?pagename=Amtrak/Page/Browse_Routes_Page&c=Page&cid=1081256321410&ssid=134. Retrieved August 11, 2009. ^ "Best Regional Colleges". www.princetonreview.com. The Princeton Review. http://www.princetonreview.com/best-regional-colleges.aspx. Retrieved August 11, 2009. ^ "Maryland Languages". City-Data. http://www.city-data.com/states/Maryland-Languages.html. ^ "Calvert County, Maryland's Success in Controlling Sprawl". Environmental Protection Agency. https://nepis.epa.gov/Exe/ZyNET.exe/P1000II5.TXT?ZyActionD=ZyDocument&Client=EPA&Index=2000+Thru+2005&Docs=&Query=&Time=&EndTime=&SearchMethod=1&TocRestrict=n&Toc=&TocEntry=&QField=&QFieldYear=&QFieldMonth=&QFieldDay=&IntQFieldOp=0&ExtQFieldOp=0&XmlQuery=&File=D%3A%5Czyfiles%5CIndex%20Data%5C00thru05%5CTxt%5C00000014%5CP1000II5.txt&User=ANONYMOUS&Password=anonymous&SortMethod=h%7C-&MaximumDocuments=1&FuzzyDegree=0&ImageQuality=r75g8/r75g8/x150y150g16/i425&Display=hpfr&DefSeekPage=x&SearchBack=ZyActionL&Back=ZyActionS&BackDesc=Results%20page&MaximumPages=1&ZyEntry=1&SeekPage=x&ZyPURL. Retrieved September 3, 2016. ^ Shields, Todd (February 16, 1997). "On Edge". The Washington Post. https://www.washingtonpost.com/wp-srv/local/longterm/library/growth/part1/southmd.htm. Retrieved September 3, 2016. ^ Resident Population Data. "Resident Population Data – 2010 Census". 2010.census.gov. Archived from the original on November 18, 2011. https://web.archive.org/web/20111118011236/http://2010.census.gov/2010census/data/apportionment-pop-text.php. Retrieved December 24, 2012. ^ a b Population Division, Laura K. Yax. "Historical Census Statistics on Population Totals By Race, 1790 to 1990, and By Hispanic Origin, 1970 to 1990, For The United States, Regions, Divisions, and States". http://www.census.gov/population/www/documentation/twps0056/twps0056.html. ^ "Maryland QuickFacts from the US Census Bureau". Archived from the original on February 7, 2015. https://web.archive.org/web/20150207070852/http://quickfacts.census.gov/qfd/states/24000.html. Retrieved January 14, 2015. ^ "Maryland – Race and Hispanic Origin: 1790 to 1990". U.S. Census Bureau. Archived from the original on July 25, 2008. https://web.archive.org/web/20080725044857/http://www.census.gov/population/www/documentation/twps0056/twps0056.html. Retrieved April 18, 2012. ^ "Maryland QuickFacts". U.S. Census Bureau. December 23, 2011. Archived from the original on January 11, 2012. https://web.archive.org/web/20120111154525/http://quickfacts.census.gov/qfd/states/24000.html. Retrieved January 14, 2012. ^ "Languages in Maryland" (PDF). U.S.ENGLISH Foundation, Inc. Archived from the original on January 17, 2013. https://web.archive.org/web/20130117073348/http://www.usefoundation.org/userdata/file/Research/Regions/maryland.pdf. Retrieved May 22, 2012. "Prince George's County has the highest percentage of Kru/Ibo/Yoruba speakers of any county in the nation." ^ Data Access and Dissemination Systems (DADS). "American FactFinder – Results". http://factfinder2.census.gov/faces/tableservices/jsf/pages/productview.xhtml?pid=ACS_12_5YR_DP02&prodType=table. Retrieved January 14, 2015. ^ a b "Irish Immigrants in Baltimore: Introduction, Teaching American History in Maryland". Maryland State Archives. http://teaching.msa.maryland.gov/000001/000000/000131/html/t131.html. ^ a b Dastagir, Alia E. (May 23, 2011). "Swampoodle: The neighborhood behind the play". ABC Channel 7: TBD online magazine. p. 2. Archived from the original on June 6, 2013. https://web.archive.org/web/20130606034415/http://www.tbd.com/articles/2011/05/swampoodle-the-neighborhood-behind-the-play-61186.html. ^ "Washington, DC Genealogy Research, Resources, and Records: Irish Neighborhoods in Old Washington". http://www.theusgenweb.org/dcgenweb/history/irish.shtml. ^ "Mulberry Tree: College News: EXPLORE MARYLAND'S HISTORY IN IRELAND". St. Mary's College of Maryland online magazine. Spring 2014. Archived from the original on July 14, 2014. https://web.archive.org/web/20140714140131/http://www.smcm.edu/mulberrytree/archives/summer10/collegenews.html. ^ "About the Celtic Society of Southern Maryland". Celtic Society of Southern Maryland. http://www.cssm.org/about-cssm/. ^ "European Immigrants in the United States". migrationpolicy.org. http://www.migrationpolicy.org/article/european-immigrants-united-states#1. Retrieved January 14, 2015. ^ "Cities with the Highest Percentage of Russians in Maryland". http://zipatlas.com/us/md/city-comparison/percentage-russian-population.htm. ^ Department of Legislative Services (June 2008). "Overview of Hispanic Community in Maryland" (PDF). pp. 6–7. http://dls.state.md.us/data/polanasubare/polanasubare_intmatnpubadm/Overview-of-Hispanic-Community.pdf. Retrieved July 5, 2012. ^ "Maryland Amish". Amish America. http://amishamerica.com/maryland-amish/. Retrieved October 6, 2017. ^ "Minority population surging in Texas". msnbc.com. Associated Press. August 18, 2005. http://www.msnbc.msn.com/id/8902484/. Retrieved December 7, 2009. ^ Turner Brinton, "Immigration Bill Could Impact Maryland Script error," Capital News Service, April 5, 2006. Retrieved July 22, 2007. ^ Yau, Jennifer (2007). "The Foreign Born from Korea in the United States". Migration Policy Institute. http://www.migrationinformation.org/USfocus/display.cfm?id=273. Retrieved December 23, 2007. ^ "About Us: Korean Americans in Maryland". Johns Hopkins Bloomberg School of Public Health. http://www.jhsph.edu/kacp/about_us.html. Retrieved December 23, 2007. ^ "Maryland". Freedom to Marry. http://www.freedomtomarry.org/states/entry/c/maryland. Retrieved September 28, 2013. ^ "Maryland Quick Facts". United States Census Bureau. https://www.census.gov/quickfacts/MD. Retrieved July 25, 2017. ^ "Face it, we're on our way to being a majority minority country". Baltimore Sun. http://www.baltimoresun.com/news/opinion/oped/bs-ed-majority-minority-20160227-story.html. Retrieved July 25, 2017. ^ "States of Change: The Demographic Evolution of the American Electorate, 1974–2060". Center for American Progress. https://cdn.americanprogress.org/wp-content/uploads/2015/02/SOC-report1.pdf. Retrieved July 25, 2016. ^ a b "Religious composition of adults in Maryland". Religious Landscape Study. The Pew Forum on Religion & Public Life. 2017. http://www.pewforum.org/religious-landscape-study/state/maryland/. Retrieved October 5, 2017. ^ "The Association of Religion Data Archives | State Membership Report". www.thearda.com. http://www.thearda.com/rcms2010/r/s/24/rcms2010_24_state_adh_2010.asp. Retrieved November 15, 2013. ^ "Table 77. Christian Church Adherents and Jewish Population – States: 2008" (Excel). United States Census Bureau. http://www.census.gov/compendia/statab/2010/tables/10s0077.xls. Retrieved October 24, 2010. ^ "Bureau of Economic Analysis, Jun 6, 2013". http://www.bea.gov/iTable/iTableHtml.cfm?reqid=70&step=10&isuri=1&7007=2012,2011,2010,2009,2008,2007,2006,2005&7093=levels&7090=70&7010=0&7035=-1&7036=-1&7001=1200&7002=1&7003=200&7004=naics&7005=-1&7006=24000. ^ Dolan, Karen (January 30, 2012). "A better way of measuring progress in Maryland". Baltimore Sun. http://www.baltimoresun.com/news/opinion/oped/bs-ed-measuring-progress-20120130,0,7700054.story. ^ "American FactFinder – Results". http://factfinder.census.gov/faces/tableservices/jsf/pages/productview.xhtml?pid=ACS_07_1YR_GCT1901.US13PR&prodType=table. ^ Frank, Robert. "Top states for millionaires per capita". CNBC. https://www.cnbc.com/id/101338309. Retrieved January 21, 2014. ^ U.S. Army Corps of Engineers. Waterborne Commerce Statistics Center. New Orleans, LA. "Tonnage for Selected U.S. Ports in 2008." Script error Revised February 17, 2010. ^ "Port of Baltimore". Automotive Logistics Buyers' Guide. Ultima Media. http://automotivelogistics.media/buyers-guide/port-of-baltimore-5. "The Port of Baltimore handles more autos than any other US port." ^ "Chesapeake and Delaware Canal". Philadelphia, PA: U.S. Army Corps of Engineers. http://www.nap.usace.army.mil/Missions/CivilWorks/ChesapeakeDelawareCanal.aspx. Retrieved September 28, 2013. ^ "Maryland's Bioscience Environment: 2009". The Maryland Biotechnology Center. http://marylandbiocenter.org/Bioscience%20of%20Maryland/Pages/factsandfigures.aspx. Retrieved August 19, 2011. ^ "Emergent BioSolutions Receives Orphan Drug Designation for BioThrax for Post-Exposure Prophylaxis of Anthrax Disease". Marketwatch.com (Dow Jones & Company). April 21, 2014. http://www.marketwatch.com/story/emergent-biosolutions-receives-orphan-drug-designation-for-biothrax-for-post-exposure-prophylaxis-of-anthrax-disease-2014-04-21. ^ Borowski, Jaclyn (July 11, 2016). "Forbes says this is the 'best-performing company' in Maryland". Baltimore Business Journal. http://www.bizjournals.com/baltimore/news/2016/07/11/forbes-says-this-is-the-best-performing-company-in.html?ed=2013-04-11. ^ "MDOT Departments". Archived from the original on May 25, 2009. https://web.archive.org/web/20090525000636/http://www.mdot.state.md.us/Contact%20Us/TSO%20Executive%20Staff%20List_2. Retrieved June 5, 2016. Maryland Department of Transportation. Retrieved on March 23, 2009. ^ "College Park Aviation Museum Home". Collegeparkaviationmuseum.com. September 12, 2013. http://www.collegeparkaviationmuseum.com/home.htm. Retrieved September 28, 2013. ^ "Frederick E. Humphreys: First Military Pilot". New York State Division of Military and Naval Affairs: Military History. December 9, 2008. http://dmna.state.ny.us/historic/articles/humphrey.htm. Retrieved November 23, 2010. ^ "Maryland State taxes". BankRate.com. http://www.bankrate.com/brm/itax/edit/state/profiles/state_tax_Md.asp. Retrieved April 9, 2008. ^ "Maryland Income Tax Information – Local Tax Rates". Individuals.marylandtaxes.com. http://individuals.marylandtaxes.com/incometax/localtax.asp. Retrieved September 22, 2008. ^ a b Leip, David. "General Election Results – Maryland". United States Election Atlas. http://uselectionatlas.org/RESULTS/. Retrieved November 18, 2016. ^ "Official Gubernatorial General Election results for Maryland". State of Maryland. http://elections.maryland.gov/elections/2010/results/Primary/index.html. Retrieved September 29, 2016. ^ "Republican Larry Hogan wins Md. governor's race in stunning upset". Washington Post. https://www.washingtonpost.com/local/md-politics/marylanders-head-to-the-polls-to-pick-governor-ag-other-local-and-state-officials/2014/11/03/88be207c-6378-11e4-bb14-4cfea1e742d5_story.html. Retrieved January 14, 2015. ^ Maryland State Board of Elections. "Voter Registration Statistics". http://www.elections.state.md.us/voter_registration/stats.html. ^ "About MSDE Script error." Maryland State Department of Education. Retrieved on March 22, 2009. ^ "Slicing education?". gazette.net. The Gazette. October 30, 2009. p. A-9. http://www.gazette.net/stories/10302009/poliedi181547_32521.shtml. Retrieved November 12, 2009. "As it stands, the $5.5 billion Maryland spends on education makes up about 40 percent of the general fund budget...."
^ de Vise, Daniel (February 5, 2009). "Md. Leads U.S. in Passing Rates on AP Exams". Washington Post: pp. B1. https://www.washingtonpost.com/wp-dyn/content/article/2009/02/04/AR2009020401459.html. Retrieved February 18, 2009. ^ "Best High Schools: Gold Medal List". usnews.com. U.S. News & World Report. https://www.usnews.com/articles/education/high-schools/2008/12/04/best-high-schools-gold-medal-list.html?PageNr=1. Retrieved November 7, 2009. ^ "UMB Fast Facts". University of Maryland, Baltimore. http://www.umaryland.edu/about-umb/umb-fast-facts/. ^ "Top 10 Maryland athletes in The Sun's 175-year history". Baltimore Sun. May 16, 2012. http://www.baltimoresun.com/sports/bal-top-175-top-10-story-gallery,0,2436595.storygallery. Retrieved March 16, 2013. ^ "State Symbols". Maryland State Archives. http://www.msa.md.gov/msa/mdmanual/01glance/html/symbols/sport.html. Retrieved December 6, 2007. ^ "STATE SYMBOLS: Marylanders take a walk, and eat cake too". Journalism.umd.edu. September 30, 2008. http://www.journalism.umd.edu/cns/wire/2008-editions/09-September-editions/080930-Tuesday/WalkingState_CNS-UMCP.html. Retrieved September 28, 2013. Brugger, Robert J. (1988). Maryland, A Middle Temperament: 1634–1980. Baltimore: Johns Hopkins University Press. ISBN 0-8018-5465-2. https://books.google.com/?id=fNspu2FxwUwC&lpg=PP1. Chappelle, Susan Ellery Green (1986). Maryland: A History of its People. Baltimore: Johns Hopkins University Press. ISBN 0-8018-3005-2. https://books.google.com/?id=zw87C-gF8GgC&lpg=PP1. Denton, Lawrence M. (1995). A Southern Star for Maryland. Baltimore: Publishing Concepts. ISBN 0-9635159-3-4. This page uses content from the English language Wikipedia. The original content was at Maryland. The list of authors can be seen in the page history. As with this Familypedia wiki, the content of Wikipedia is available under the Creative Commons License.